Posted by Pamela Eve on November 11, 2016. The Worshipful Company of Hackney Carriage Drivers (WCHCD) have presented Plan’s Marketing Director Grant Georgiades with their renowned title of Friend of the Cab Trade. The award is given to an individual from outside of the industry, who promote the Licensed Trade in various ways. Our winner stood out thanks to his continued positive promotion of the trade on social media, generous charity sponsorships and by actively lobbying the regulator to remove uninsured private hire drivers from our roads. However what clinched this award was his involvement in the #Clock2Rock Rally; which involved a near death experience for him and his team from Plan Insurance Brokers. If you do follow Plan on Twitter then you will know that a French driver fell asleep and collided with their TX1 whilst they were attempting to get from London to Gibraltar in 36 hours; all to raise funds for the Magical Taxi tour. Colin highlighted Plan’s Taxi Insurance Checker (TIC) campaign that aims to remove uninsured hire and reward drivers from London’s roads. Plan have been lobbying the regulator to create an online portal that will in able them to detect taxi and private hire drivers who are operating without the appropriate cover. The company noted how Plan encourage creativity within the trade. Amongst other sponsorships Plan have supported the YouTube Channel of The Gentleman Cabbie as he attempts to bring back the lost art of conversation to London and the football based podcast, The Cab Cast which is a recorded by taxi drivers in the back of one of their cabs. Plan are keen to invest their marketing efforts in a constructive way for the trade. Hence they proposed the Cab Man Charter and backed London Taxi PR campaign. Possibly their highest profile endeavour was the #Clock2Rock Challenge. 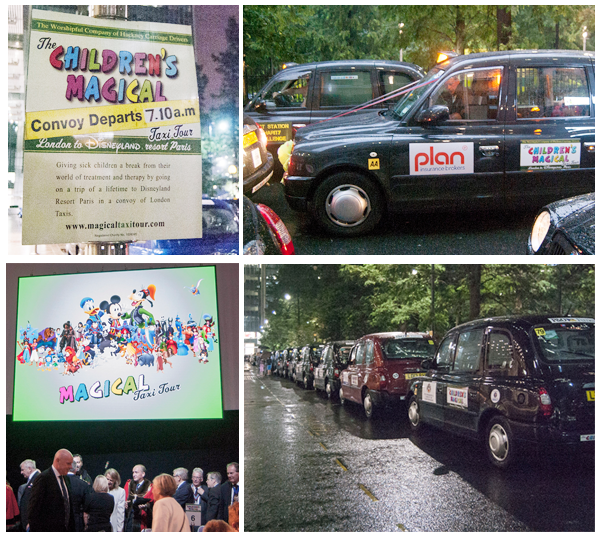 Plan organised a rally in aid of The Magical Taxi Tour and as Colin mentioned, Grant and his three colleagues were involved in a serious motorway collision that was not their fault. It was a regrettable event but the main thing was the team survived and the coverage the incident received mean they still raised enough to sponsor three MTT cabs. I love being able to support the cab trade. It’s a tough time for drivers but we try to remain upbeat and promote the trade in a positive way. Cabbies are an industrious bunch so there’s always something happening which helps keep it fun. We look to get involved and lend our support where and whenever we can. It’s a tremendous honour to have our hard work recognised. He went on to say that he received the award on behalf of Plan as it really is a team effort over the course of the year. We very much look forward to continued involvement in the years to come. Presented to Malcom Linskey (Past Master) in recognition of his life dedicated to the trade and achievement of founding The Knowledge School. Presented to Mr J & Mrs E Stubbs for their incredible support and contribution to organising of the Magical Taxi Tour. This year it was presented to Allen Pembroke for bravery shown whilst aiding numerous victims of the horrific terrorist attack in Tunisia in 2015 that saw 38 innocent tourists gun down on a beach. Named after soldier Frederick Hitch who received the Victoria Cross for valour displayed at the infamous Battle of Rorkes Drift, and went on to become a London black cab driver.